I must be channeling Charley Sheen today, because I just knocked out not one, not two, not two and three-quarters, but five miles on the elliptical machine! I have one speed: GO! You can’t process me with a normal brain. I’m an F-18, bro! Alright, calm. Calm. Breath in. Breath out. Endorphins dissipating. Pulse dropping under 100. Charlie Sheen back in his black rubber suite, mouth zippered shut, and locked in the steamer trunk. 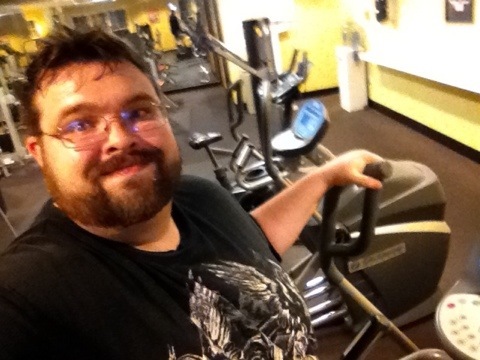 Since April 7, I’ve walked twenty-four miles on the elliptical machine in the tiny gymnasium at my apartment. While an average of less than two miles a day won’t get me to my goal of one thousand miles by April 7, 2013, days like today give me confidence that I can bring that average up to around four miles a day. I’m also hoping that I can increase my average speed from five miles per hour to six miles per hour within the next two months. Of course, the key to progress is getting out there and doing it every day. With work and family commitments, this can be tough. Julia, my wife, is being super-supportive and picking up even more of the slack around the house while I’m off on my evening stroll. She is the most amazing woman, challenging me to be better without nagging me; loving me for who I am even while helping me grow.